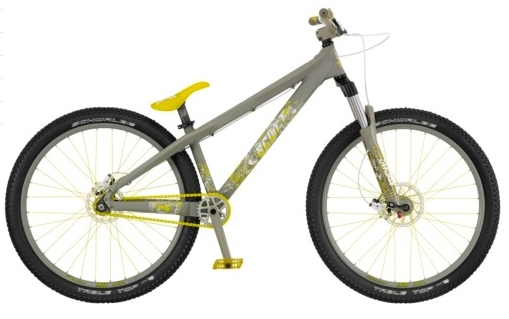 How to choose a dirt jumping mountain bike: Dirt jumping bikes are first and foremost made for dirt jumping, but they also work very well at the skatepark and for most slopestyle applications. Hardtails are the most common, but full-suspension options also exist. Suspension travel is typically less than 4-inches, and suspension settings are usually very firm to prevent bottoming while jumping. It's not uncommon to see dirt jumping bikes come stock without a front brake, as many people find they get in the way of tricks. Many dirt jumpers run single speed gearing for simplicity and ease of maintenance. Tires are generally 2.1-2.3-inches wide and are made to roll fast, so they don't have many knobs. Fork: For dirt jumping, it’s very important to get a strong fork that can withstand a lot of abuse. As a test, approach the bike from the front and pinch the wheel between your legs. Grab the bars and turn them side to side a few times. A flexible fork (one that you can see twisting) should be avoided. Chain Retention: If the bike is single-speed, make sure that there is some sort of chain tensioner on the dropouts. Horizontal dropouts with a bolt-on rear axle are the best for single-speed dirt jumpers. If the bike has gears, make sure that it has a chainguide on the front sprocket. Losing a chain while dirt jumping never ends well. Wheels: Wheels take a beating when dirt jumping, especially when you are first learning how to jump, or when you’re learning new tricks. Because of this, look for wheels that have 36 spokes and always run at least 45 psi in your tires. Tires: Tires with small knobs or smooth tread patterns are preferred for dirt jumping and skatepark use. They roll faster, making jump sets easier. The most common way to size a dirt jump bike is the horizontal distance between the center of the head tube and the center of the seat tube. This measure is called 'effective top tube length' and sometimes 'horizontal top tube length'. The taller you are, the longer the top tube you’ll want. In general, riders more than 5’11” tall ride large dirt jump frames. Deciding how much to spend is a tough decision. As a general rule, the more you spend the better bike you get. There will be major difference between a $900 bike and a $2500 bike. In general, the more expensive a bike is, the more durable it will be (at least until you start getting into the high-end where lightweight construction may reduce durability) and the better components will perform. If you’ll be riding regularly, we recommend spending at least $900 on a dirt jumping bike. Anything less and you’ll be constantly repairing the bike and replacing components. If you’re a first-time buyer, you may be tempted to purchase a low-end bike and later upgrade the components as necessary. Know that it is often much cheaper to buy the components on the bike in the first place than it is to buy components later and upgrade. For comparison, the three bikes below are priced at $550, $900, and $1600, respectively.